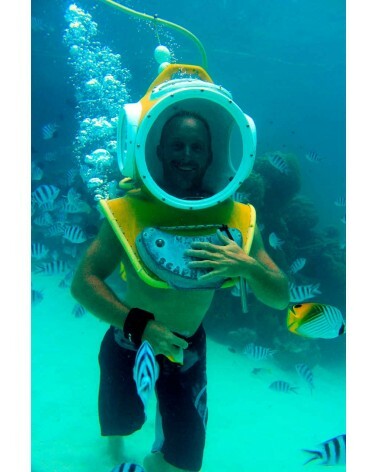 Among the best excursions and water activities in Bora Bora for over 10 years, Aqua Safari Helmet Diving is halfway between scuba diving and snorkeling! Accessible to all and even to the youngest (6 years old), beginner or advanced, no need to know how to swim to live an unforgettable experience underwater. Without getting your head wet you will discover the coral garden and the reef of Bora Bora. In a swimsuit, in the crystal clear water of the most beautiful lagoon in the world, a diving instructor will guide you to an unforgettable underwater safari! Surrounded by hundreds of tropical fish of all colors, you will walk on the sand in less than 3 meters deep! Aqua Safari offers shared tours and private tours. Free pick up by boat or bus. Team Aqua Safari bora bora takes care of your transportation! Bus or boat, we organize transfers from your hotel to our business. Consisting of deep experience instructor and graduate guide lagoon, aqua safari team bora bora will make you live a half unforgettable day safely. We attach great importance to the security of your personal information. You can pay by PayPal safely.